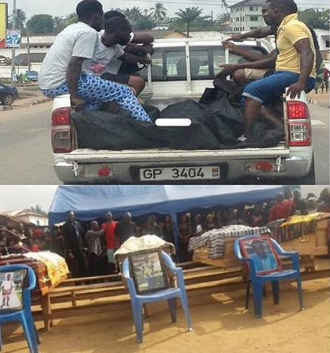 four boys who drowned, last Sunday at Bosumtwi-sam fishing Harbour in Sekendi, Ghana after rescuing a drowning friend, have been buried. Frank Amankwaa, 18, Joseph Bonful, 20, Agya Ackon and Evan, were parts of about 15 youth eho has gone to the sky Beach haven to have fun on that fateful day. The friend they were trying to rescue, Julius 19, survived and he is currently undergoing treatment at the Effia Nkwanta Regional Hospital.